ASUS My Cinema-PE6300Hybrid supports both digital (DVBT) and analog (PAL/NTSC) TV programs. Furthermore, it is embedded with a hardware MPEG2 encoder that dramatically reduces CPU loading - helping guarantee high-quality video outputs. The ASUS My Cinema-PE6300Hybrid is also equipped with an array of versatile utilities that lets users enjoy all-in-one multimedia entertainment on the PC. The ASUS My Cinema-PE6300Hybrid is a combination of an analog and digital TV receiver. With this nifty piece of hardware, users will be able to watch and record high-quality digital (DVBT) or analog (PAL/NTSC) TV programs on their PCs. 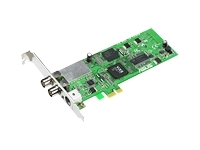 Adopting the brand-new PCI Express x1 interface, transmission speeds of up to 500 MB/s can be achieved - an improvement of almost 3 times over conventional technology. Additionally, the My Cinema-PE6300Hybrid comes embedded with a built-in advanced hardware noise reduction technology and a hardware MPEG2 encoder, which remarkably reduces the CPU loading and guarantees high-quality video output. Therefore, users can even surf the Internet and watch TV programs at the same time - without any lagging, for the best video quality.